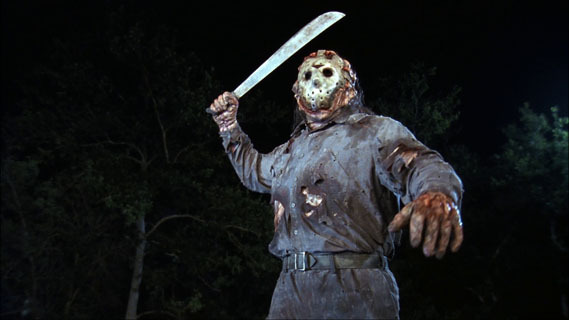 Jason Voorhees is one of the deadliest horror movie villains of all-time, and throughout the first 12 installments of the Friday the 13th horror movie series, his iconic hockey mask has changed looks as many times. To explore the transition through all the different mask designs that Jason has worn (so far…) we made this animation to cycle through each one in chronological order. From burlap bags in Part 2, to a cybernetic uber-mask in Jason X, that’s a lot of different Jason masks! 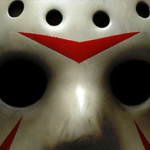 Keep on reading for a detailed breakdown of every Jason mask from every Friday the 13th. The best part about these masks is that they’re all pretty easy to DIY yourself (well, except for one). Most of them are similar enough to create from a basic white hockey mask, or from a Jason mask you might already have. Just nail the few distinguishing features from your movie of choice, and you’re good to go. 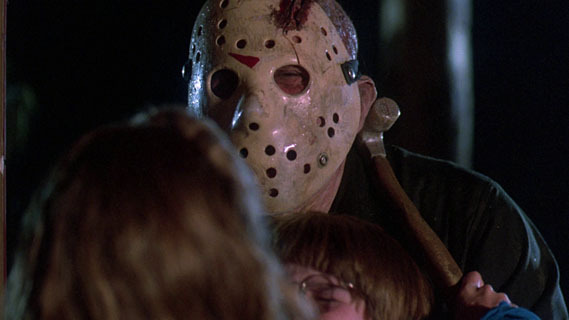 The first time a masked Jason appeared on screen was in the second movie — in Friday the 13th, we only see Jason’s unmasked, disfigured face. 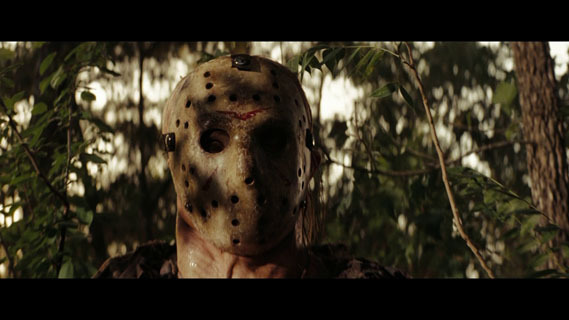 The hockey mask didn’t exist yet, either, as Jason merely made his own mask from a piece of burlap. One eyehole torn into place and one rope around the neck later, and you’ve got Jason Voorhees’ first mask. This mask is pretty simple to DIY, too. Burlap is readily available at every craft store, and a sack is pretty easy to sew, even if you can’t sew. Then, just tear an eye hole and measure some clothesline or twine to fit around your neck. 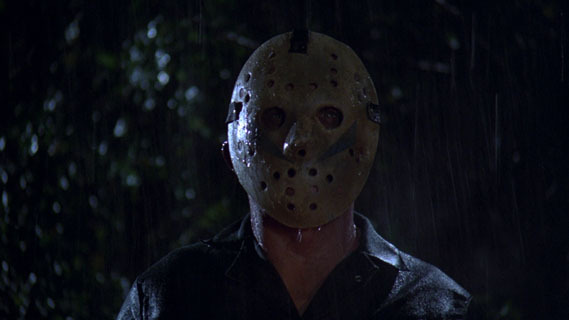 The third Friday the 13th saw the introduction of the classic hockey mask, which Jason gets from Shelly. The white mask is dingy and worn, but undamaged, and the red triangular design is all intact. To turn a plain white hockey mask into a Jason mask like this, you can use red duct tape to make the facial design, or use stencils and spray paint. Brass buttons and extra snaps can be glued on for more detail. This Jason mask features the mark left by the axe that Jason is attacked with in the previous movie. The axe mark is also included in most of the following sequels, making it almost as iconic as the mask itself. If you already have a classic Jason mask, you can easily modify it into the look from this movie. Use a handsaw to cut a notch in the top the mask, and use red paint or fake blood to stain the area around the mask. Printed or painted pieces of the red triangle design can be sanded off, which will also help scuff the mask in general. 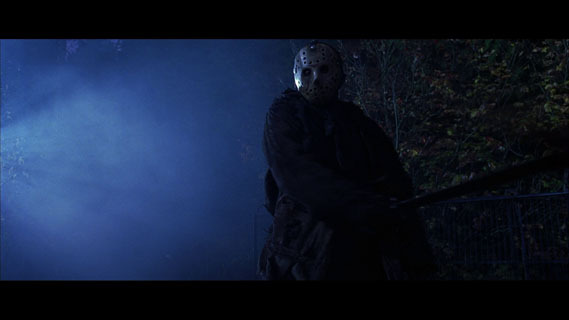 In A New Beginning, it’s a Jason imposter that does the killing. You can tell that he’s a psychopath, and not just a cosplayer, because his mask is just all wrong. The same mask from The Final Chapter is also seen during hallucination scenes in this movie. This is the only Jason mask to feature a blue design, rather than red, but it can be created with tape or paint in the same way. With a mask like this, as well as a Final Chapter mask, you can dress up as and swap between Imposter Jason and Hallucination Jason on the fly. 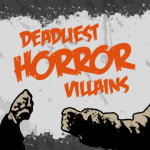 Every horror franchise has a turning point at which it becomes more funny than scary. 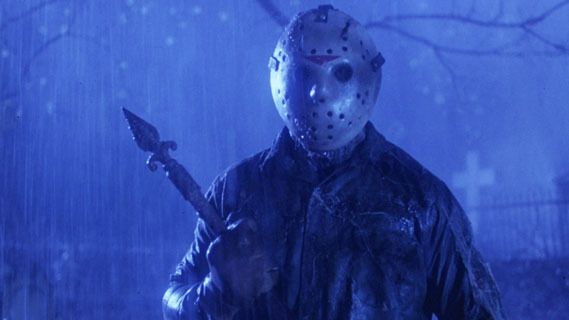 Lots of fans agree that this was Jason Lives for the Friday movies. Not only did the kills start getting crazier and more over the top, but Jason is a zombie now, for no other reason than because zombies. As for the mask, it’s pretty similar to the mask from Final Chapter, but the axe mark is smaller, there’s no blood, and there’s only one red triangle on the face. The straps also changed to leather ones instead of black fabric, which can be replicated with old leather belts. 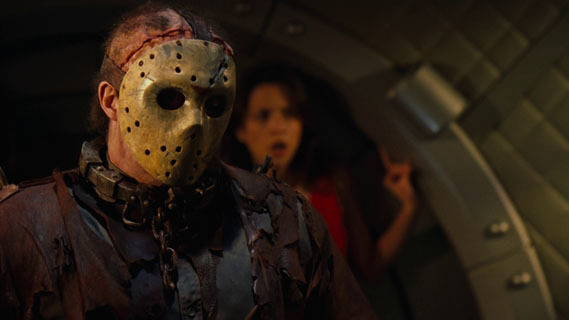 The role of Jason got a new actor in this movie (Kane Hodder, who was also Jason in the next three films), but a lot of details on the mask stayed the same, like the brow triangle. The axe mark also returned to its previous size. 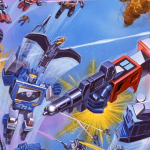 One big change, though, is that the lower left portion of the mask has been destroyed, following a run-in with an outboard motor. To achieve a similar effect on a mask of your own, remove big pieces of material with a saw, then scuff up the edge with a rotary tool like a Dremel. 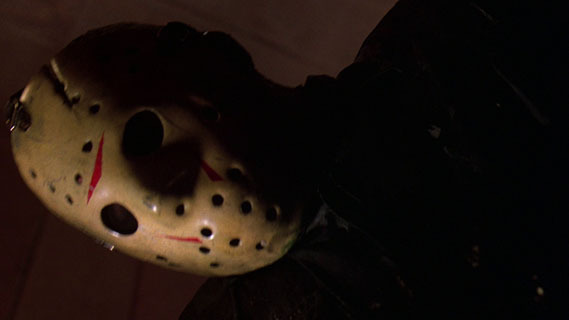 The Jason Takes Manhattan mask is nearly identical to the mask from Part III, but the triangle design on the cheeks has been reversed. The basic straps of previous masks have also been replaced with a series of buckles. The Final Friday, the second Friday the 13th movie with “Final” in the title that didn’t end up being the last one, sees Jason’s mask return to the New Blood look. A big difference, though, is that the mask now appears to be partially fused onto Jason’s face. The mask is still gouged up with pieces missing, but it also looks scorched and burned now, with extra straps hastily put in place. A few bullet holes with burn marks surrounding them also dot the mask face. 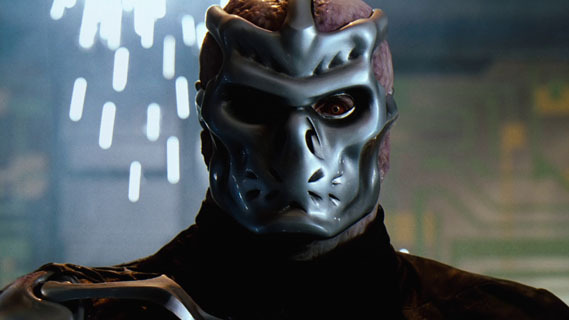 Jason X represents the return from the longest gap to date in the Friday franchise timeline, and the largest departure in mask design, too. 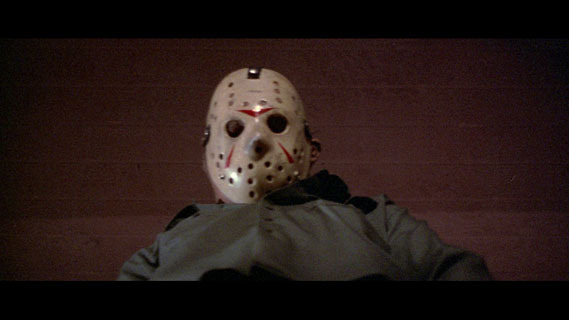 At first, Jason has another hockey mask – similar to the one from Jason Lives, but more angularly sculpted. After transforming into Uber Jason, his mask is transformed as well. The Uber Jason mask is a metallic, cybernetic mask that takes design inspiration from modern hockey equipment as well as the world of sci-fi. 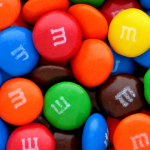 Because it’s so unique, it’s significantly more difficult to DIY than the others. 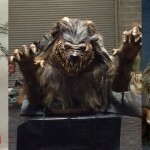 Unless you’re already pretty good at sculpting, you might just want to seek out a replica. Jason Voorhees and Freddy Krueger clash in this 2003 crossover, which is also the eighth movie in the Nightmare on Elm Street series. The most notable thing about Jason’s mask in this movie is that becomes scratched by Freddy’s bladed glove as the two battle. Aside from that, this mask is most similar to the Friday the 13th Part III mask, albeit in more of a brownish color and with larger rivets. 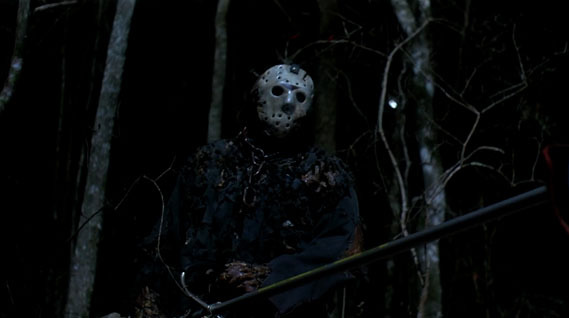 In the 2009 reboot of the original Friday the 13th film, Jason is seen with a mask this time around. It’s the classic hockey mask from Part III, right down to the red triangles and metal snaps. It’s a little gritter, a little grungier, and a little dirtier, but it’s pretty much the same mask. 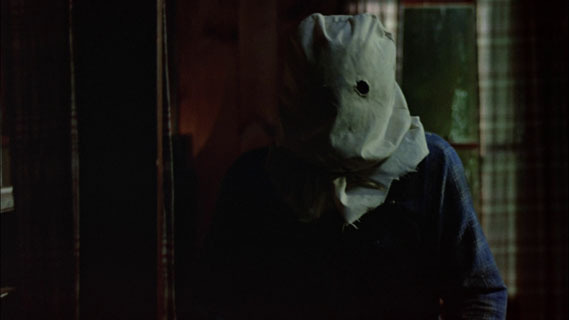 Jason is also once again seen with his burlap sack mask in this movie, just like in Part 2. If you love Friday the 13th as much as we do, then leave a comment below or share your thoughts with us on Facebook and Twitter. Check out our Pinterest page for more infographics and costume ideas, too. 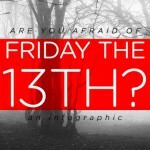 Infographic: Are You Afraid of Friday the 13th? I like Jason Voorhees so much and it is horror movies and books and costumes of him.